Back in 2015, it may be recalled, everyone was getting very excited about Raghuram Rajan, Reserve Bank of India (RBI) governor, and the government. 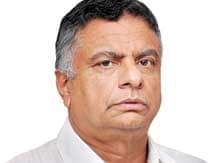 M G Warrier, an old RBI hand, had commented thus: “There have been unending disputes about whether the curd is dependent on the pot for its existence or whether the pot gets value addition because it contains the curd (Thakrasyaadhaaram Ghatam vaa Ghatasyaadhaaram Thakram? )” I don’t think we will ever know.